Packaged in 32-ounce (1 L) and 4-ounce (118 ml) bottles of concentrated stain. Standard Dilution is 3 parts water to 1 part stain. At diluted strength coverage is approximately 200-400 square feet per gallon, but varies with surface conditions. Formulated to readily permeate a properly prepared concrete surface and create translucent color variations similar to reactive acid stain. A low odor, water-based, environmentally and user-friendly concrete staining system with low VOC (15-50 g/L depending on color selection). 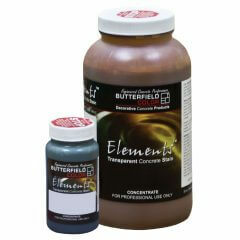 CHO™ Concrete Cleaner required for washing substrate prior to staining with Elements® Transparent Stain.